Dental implants are inserted directly into the jaw to provide the strongest and longest-lasting of all tooth replacement options. Because they are inserted into the jaw, dental implants are able to integrate into bone, replace tooth roots, and prevent the bone loss associated with missing teeth. But, does this insertion into the jaw hurt? And what do our Denver implant dentists do to guard against patient discomfort? 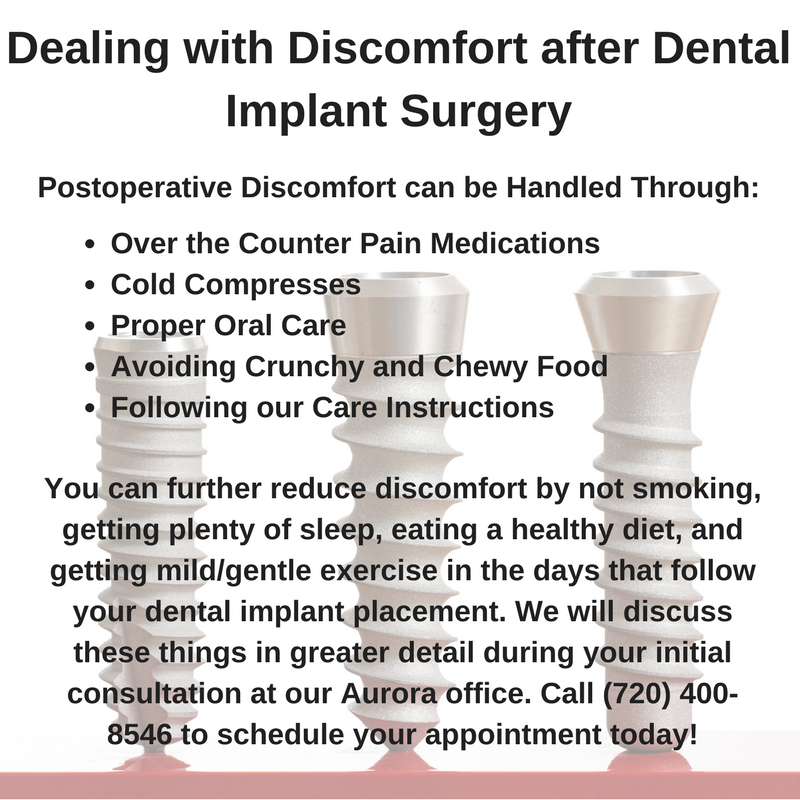 At Aspenwood Dental our patients often have minimal to no discomfort following implant surgery. Any discomfort they do experience is aggressively managed by our entire dental team. First things first, dental implants do not hurt following recovery. Once integrated into your jaw, your implants will be as noticeable as the roots of your natural teeth – which is to say not at all. Preparation for your dental implants will be painless as well, though steps such as quitting smoking, which is engouraged, may be difficult for some patients. .
During the planning phase of your implant procedure we will provide you with detailed instructions that help you prepare for your oral surgery and the short recovery period that may follow. Adhering to these instructions will help reduce your risks for postoperative discomfort, surgical complications, and dental implant failure. If you have questions about dental implants, their placement, or your recovery period, we can address those during the planning phase of your procedure as well. We hold your comfort as a top priority and will work directly with you to help ensure you remain at ease during your time in our care. To place dental implants, a small hole will need to be prepared in the jaw. This portion of the procedure is done under local anesthetic, allowing you to remain completely comfortable while your implants are being placed. If local anesthetic is not enough for you to feel at ease, we also offer sedation dentistry at our Aurora office. Sedation dentistry is a safe and effective way to eliminate anxiety and nervousness before and during your implant placement procedure, and remains an ideal option for patients who struggle with dental phobia, highly sensitive teeth, TMJ, and other emotional and physical discomforts. If this option is appealing to you, we will gladly discuss your candidacy for sedation dentistry during your initial consultation. There may be some tenderness in the days immediately following your procedure. As with any oral surgery, this can most easily be dealt with through the use of pain medications such as acetaminophen or ibuprofen. Even mini dental implants can result in some postoperative soreness and may require over the counter medications for one to two days. However, all dental implants should be painless once initial recovery has completed – a process that typically takes one to two weeks. During your tooth replacement consultation we can talk in more detail about postoperateve management and how you can work to ensure the fastest and most comfortable recovery period possible. To schedule your dental implants consultation, please call Aspenwood Dental Associates at 720-400-8546 today. You can also schedule a consultation by contacting the Colorado Dental Implant Center online. Located in Aurora, our implant dentists welcome patients living in Denver along the I-25 corridor, and throughout Northern Colorado.